So this one was a bit more of a challenge. I had done this stitch before, but figuring out how to increase and how NOT to increase was tough. 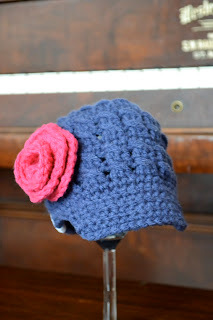 This little hat was so cute that the client ordered two more when it was done, so I'm guessing it was a success. I'm going to try my best to describe what I did. I'm not even sure this is a true cross over stitch. If someone knows the proper name, please leave a comment. Round 1: in magic ring sc 8 sts. DO NOT JOIN. Round 3: ch 3(counts as dc) dc in next st. Here is where the cross over 2 dc st is made. yarn over hook (yoh) and insert the hook backwards from front to back in the last sc. (where you did the ch 3). yoh and draw up a loop keeping the yarn loose. yoh and draw through 2 strands on hook. Draw through last two strands. cross over 2 dc made. (cr 2 dc). Dc in next 2 sts. cr 2 dc. repet for a total of 8 cr 2 dc. join with sl st to top of ch 3. Round 5: ch 3 (counts as first dc) dc in next st. cr 2 dc. * dc in next 2 sts. cr 2 dc into skipped st* Repeat around for a total of 16 cr 2 dc. Join with sl st to top of ch 3. ch3. Round 6: ch 1. sc in next 48 sts. join with sl st. Round 7&8: ch 3 (counts as first dc) dc in next st. cr 2 dc. *skip next st. dc in next 2 sts. cr 2 dc into skipped st* Repeat around for a total of 16 cr 2 dc. Join with sl st to top of ch 3. ch3. Round 12: ch 1. sc in next 48 sts. join with sl st. DO NOT BREAK YARN. Row 2-4: ch 1 sc in next 18 sts working sl st back each time. Row 5: ch 1 skip first st. work sc across brim to second last st. sl st all the way around the hat working sts evenly down and up the sides of the brim. Finish off with invisible knot. I added a rose onto the hat. You can find the pattern here. 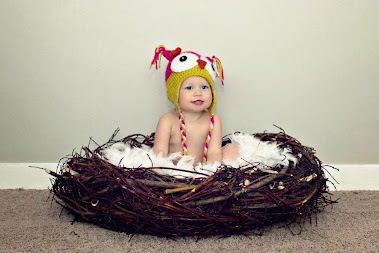 This hat works for boys too! Little knotty knotty lables. Such a nice finishing touch! Did you notice something? I had these little labels made up, aren't they so cute? They say knotty knotty, but when folded you only end up seeing one of the 'knotty' s. They finish the hats up so nice. I just love them! **You may use this pattern to sell items, but I request that a link or credit be given back to this site**This is a ©Knotty Knotty Crochet pattern, and may not under any circumstances be sold in whole or in part. Duplication is by written permission only. I like the pattern and didn't have much trouble figuring out the cross over stitch. I keep running into a problem though, After Round 3, I am coming up with 8 cr 2 dc and only 24 stitches, not 46. What am I doing wrong? I had the same problem and can't figure out what is wrong. Did you figure it out? Hi there, I know its been a while but I think I have the pattern updated now. Give it a try and let me know if you have any other issues. I will try to get this figured out ASAP. Sorry. did you ever figure out what was wrong with the count after row 3 i have redone it 6 diff times and keep coming up with only 24 stitches. I think its fixed now. Sorry for the long wait. would you be able to tell me when to increase to make this in a larger size? I LOVE this hat and it turned out great! But unfortunately it didn't fit my granddaughter. I'd love to make one in a larger size. I like your blog so much. I study English to read this and make them for my 4 kids. Hi, I think with the increasing rows, the single crochet rows, you will have 24 at first, and if you use the rule of increase you will have 32 the next round, 48 the next, 60 the next, and so on increasing by 12 each round. So you will do "2sc in next stitch, sc in next 2 st" to get 24, then do "2sc in next stitch, sc in next 3 st" to get 32, then do "2 sc in next st, sc in next 4 st" to get 48 st in your round, etc. So each round you will do one more single crochet in between the 2sc in st. This will continue and make a perfect circle. If you want to make the hat bigger, this is the round you increase in. So if you increase till you have 48 sc, then you will have 16 cr 2 dc (48 divided by 3) in your following rounds, or if you increase to 60 sc, you will have 20 cr 2 dc (60 divided by 3) hope that all makes sense.... I love love this pattern btw, I've made probably 10 of them in all different sizes! I also was wondering if I could sell the items I make from your patterns, they are usually modified, but I love them, so cute and easy to follow. A friend of mine and I are currently selling leather soled baby booties, and would love to market some hats as well. Farmers Market idea, I would love to credit the site though! Yes you are free to sell. I do ask that you put somewhere on the label or tag that it is an original Knotty Knotty Crochet pattern. I give my patterns for free but I make money off of my blog. Thanks so much. 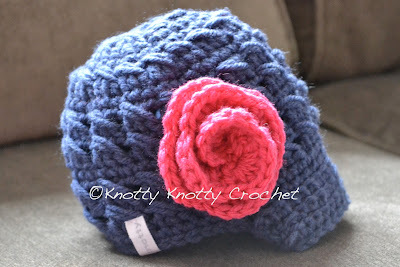 This is the best newsboy pattern I've seen, the flower makes it so perfect. Thank you for sharing this pattern.